Prince Albert Friend: Wie is bang vir die Dood? 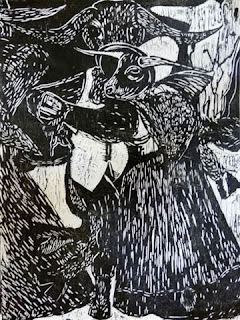 Elza Botha, better known as Dr Miles, art curator, historian, writer is also an artist, one of our finest print makers. Botha’s ground breaking exhibition at the Prince Albert Art Gallery in the Seven Arches building is one of the most exciting I have seen in South Africa, uses woodcut, the oldest form of printing. It is a journey into the past, to her (and my) roots, embedded in dark soil. Ouma and Oupa, bywoners, reading the Bible, the only book they read. [Boekevattyd]. It was a mistake to include her coloured multi media works in such a small space: I visited the exhibition several times, and always they seemed to compete with, distract from the woodcuts, the stark richness of dense black ink on white. Her work, meticulously executed, is driven by mad passions: juxtaposing various [wo]manifestations of the anima: innocent girl, sensual woman, wise crone. In Karoo ontmoeting, self portraits of the artist are shadowed by the Owl, bird of the Night. Elza B: Dit gaan natuurlik alles oor die dans met die Dood. Hennie B: Jou werk‘donker’: [Dit gedurende die donkerste ure van die nag wanneer jy kan droom – Genet]. Jou werk is ook ‘n glim/lag, ‘n Feesviering. EB: skrik nie vir die donker nie, en ons is nou in Kali Yuga. Hinduism cosmogony spans, not 6 days, but millions of years. This age, Kali Yuga, is one of destruction, immoral leaders, famine, earthquakes, torture, war. Chaos. Botha shows that liberation comes when we lose the fear of our shadows, the night and its inhabitants - spoke, incubi, succubae, tokoloshes, when we acknowledge Death, not as a fiend, but as a lover. At the start of spring, the followers of the three monotheistic religions transfer their sins onto a goat [and in one instance, a man, the Lamb of God], which is slaughtered and offered to the Supreme Being. This rite isn’t performed only at Easter, but daily: the tribe alienates, marginalises and attempts to destroy the individual, the scapegoat [sondebok]. The tribe feels [temporarily] cleansed, pure, united. The Balke series refers to the opskop – barn dance – of our youth, our age of innocence. A goat, the pagan horned god, the shadow of God, is crucified. Other creatures - human and animal merge into one - are joyfully participating in a danse macabre. This exhibition is a journey into the future. I explain the context to British-born Rossetta: Volkspele at school, the only time when [supervised] the genders could meet. I was too shy to ask a girl to dance. But no longer. I teach Rossetta: Afrikaners is plesierig, hulle hou van partytjies en dan maak hulle so. We bow. She turns, I turn. And we whirl around and around under the Karoo sky.